I’ve always believed that you can create an impact and give a wedding design the wow factor without abundant decor and maximalist styling. 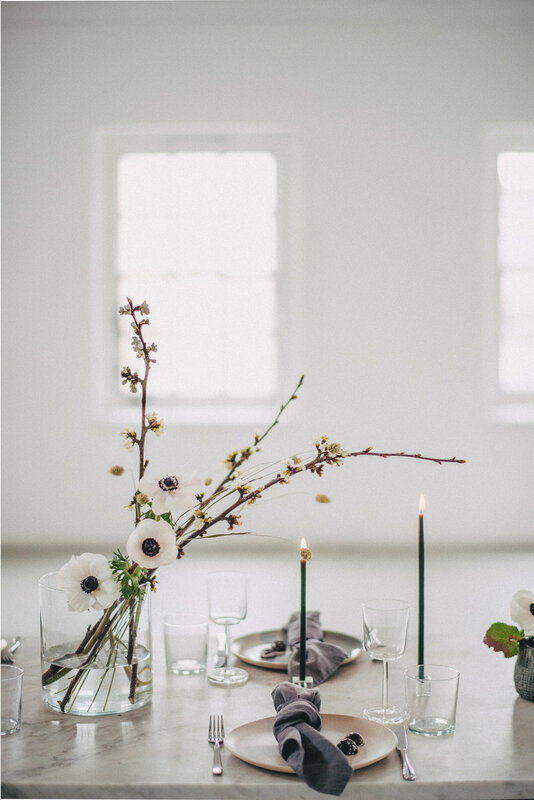 Yes decadent florals, hundreds of candles and/or lots of lush fabrics can really pack a punch when it comes to wedding styling. 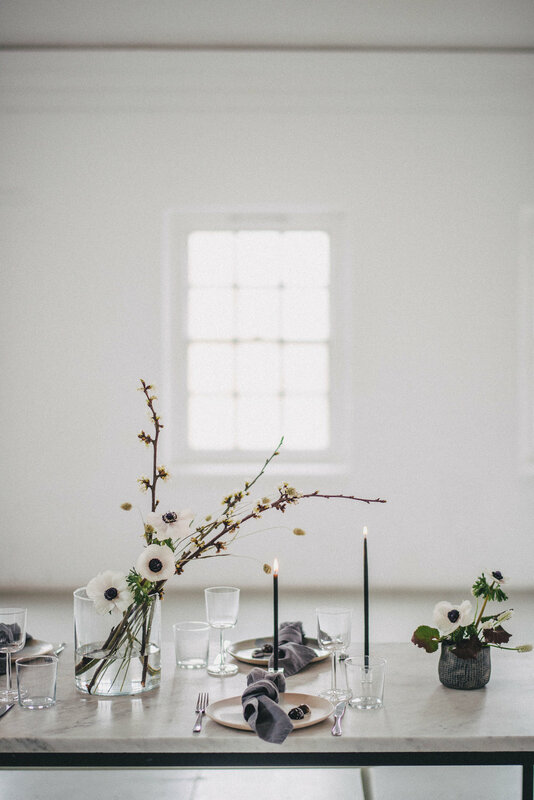 But there is also a place for simplistic beauty, understated elegance and minimalist decor in wedding design. 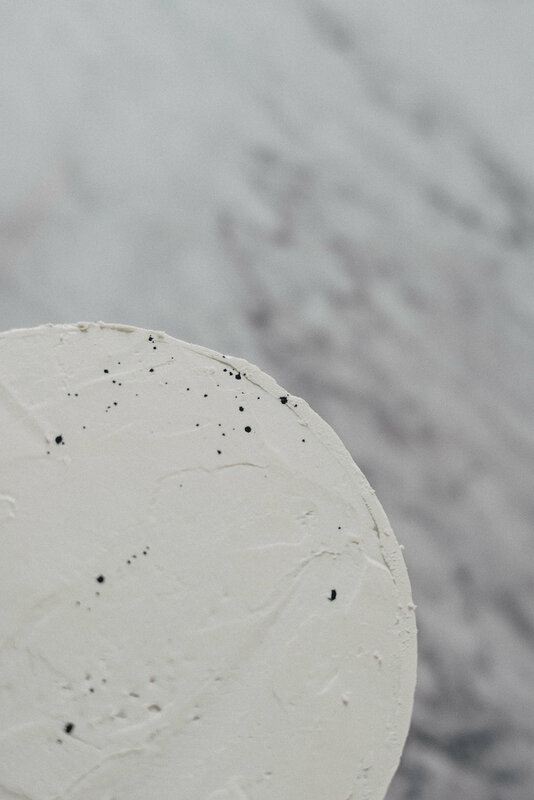 There is something free and aesthetically pleasing about unfussy but carefully curated minimalist styling. 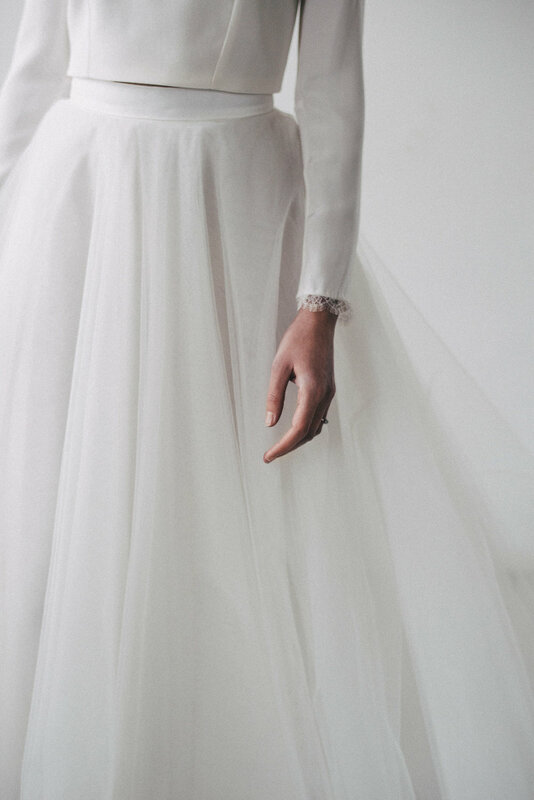 Natural light, negative space and texture really come in to their own in this world. Spaces can become magical and meaningful with just a few carefully selected elements. A long term admirer of the stylish Scandinavian aesthetic, minimalist design has a special place in my heart. It was over our shared love of understated beauty and contemporary clean lines that Genevieve and I bonded. Genevieve is a fellow London creative and talented wedding photographer and on meeting her I knew we needed to work together. 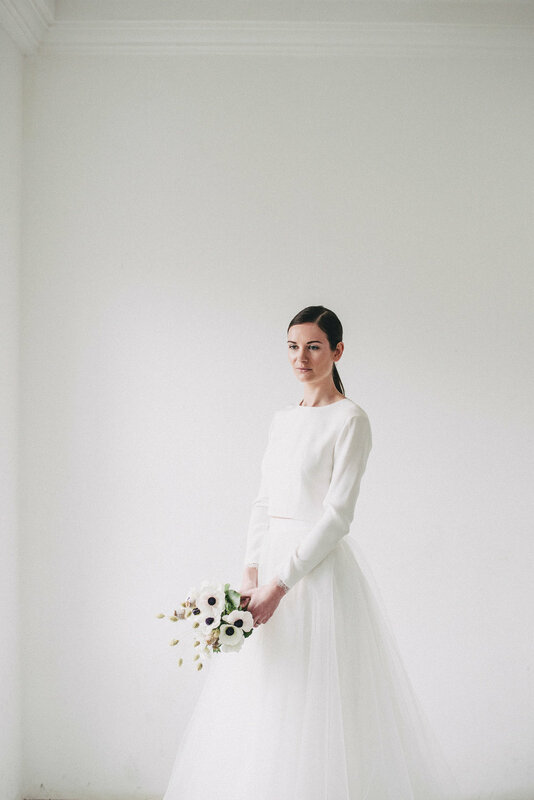 I wanted to put together a wedding inspiration shoot that could show couples who have a more minimalist style how to take that out of their homes and wardrobes and put it into their wedding design. I love that London has so many amazing unique venues available for weddings. 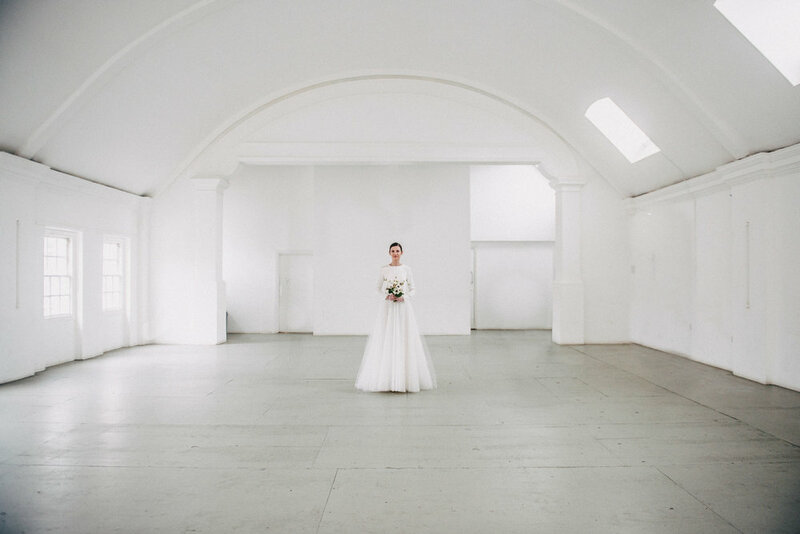 If you look outside of the ones that market themselves predominantly as a wedding venue there are so many amazing art galleries, warehouses, photographic studios, community spaces, industrial buildings, museums, etc. that are available for hire. One such venue is one of my local Hackney spaces, Core Clapton. They are first and foremost a charity specialising in making health and wellbeing affordable. 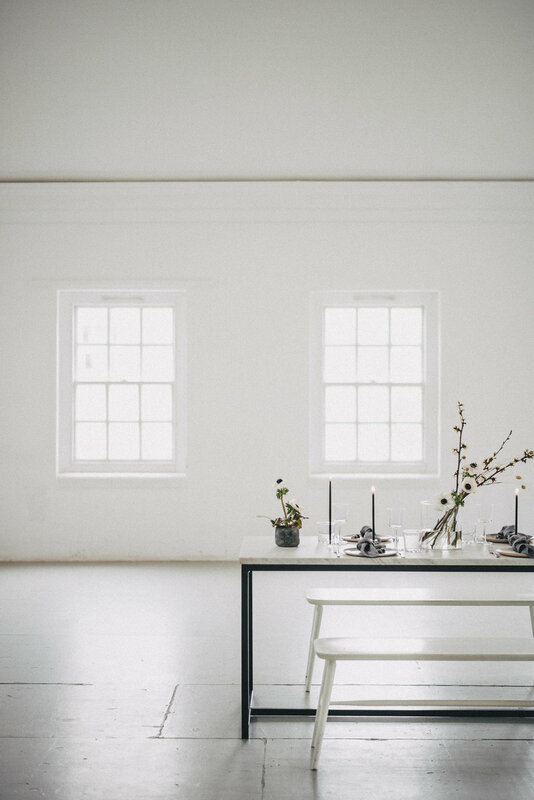 The hire space also happens to be a huge ethereal light space and the perfect blank canvas a wedding stylist dreams of working with. 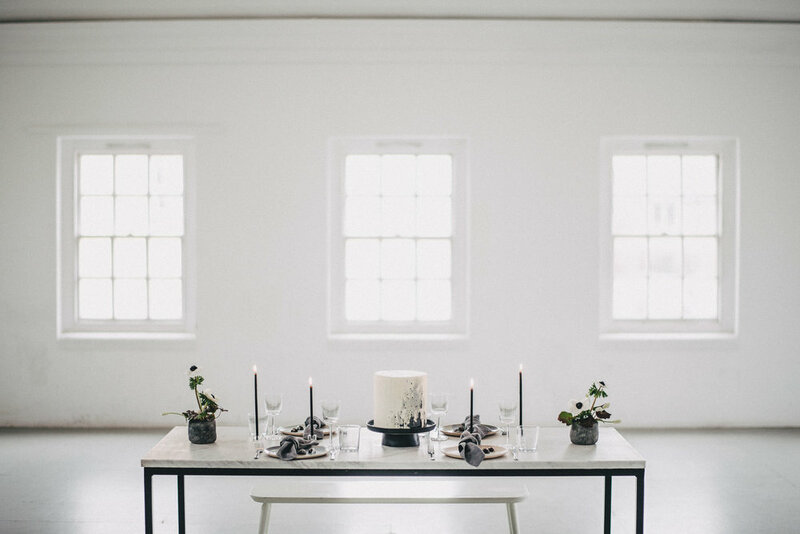 The white walls, white lights, and complete lack of furniture made it the perfect backdrop for our minimalist design. Genevieve and I are both drawn to the Japanese floral art of Ikebana which typically only uses a handful of botanical elements arranged in a very considered way. The reason I love this style of floral arrangement is the sense of movement that is created with very few elements. They are beautifully sculptural and directional, which is what makes them so awe inspiring. It was such a pleasure to work with floral designer Kitten Grayson who totally realised my brief and created magic with just a few carefully selected stems. We worked with a key flower, the Anemone, after which the brand is named. Traditionally this flower is arranged with lots of other blooms but pairing it with blossom branches and dried grasses worked wonderfully for this minimalist design. 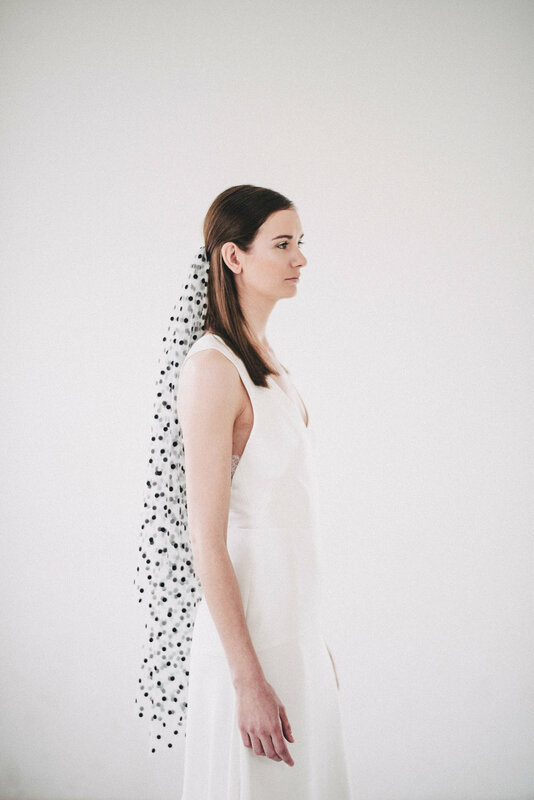 The flower also inspired the colour palette for the shoot; with white taking centre stage with touches of grey and highlights of black. These grey and black elements stop the design looking too flat, they add depth. For colour-shy loyal minimalists adding one contrast to an all white design will give it the wow factor. Consider neutrals such as black, navy or grey, adding green through foliage, selecting a soft colour such as pale pink, a subtle yellow, light blue, or adding a muted natural colour such as khaki, light terracotta or taupe. 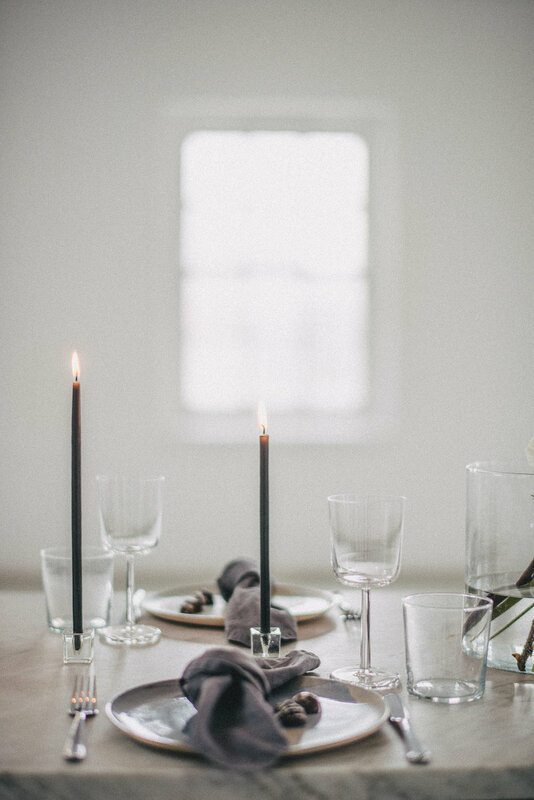 Creating a minimal yet impactful table design is all about selecting one single statement piece, layered with more paired down pieces. 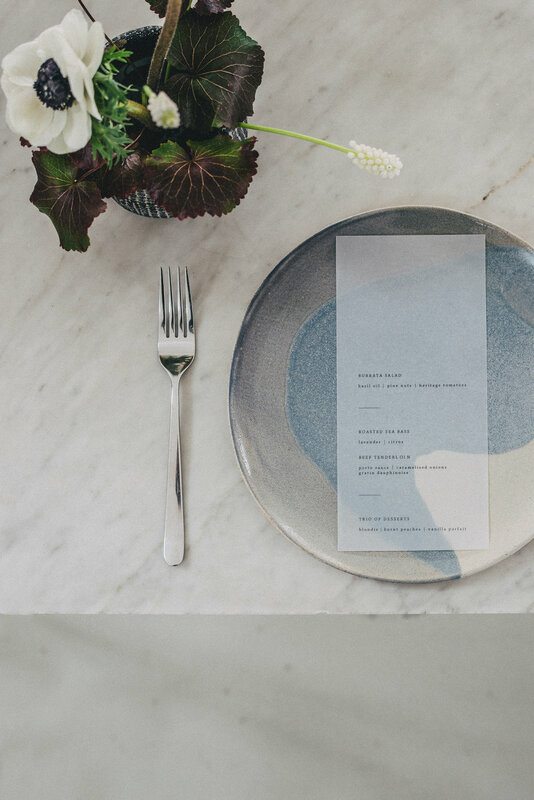 I styled each place setting with stunning handmade ceramic plates by Lucia Fraser. 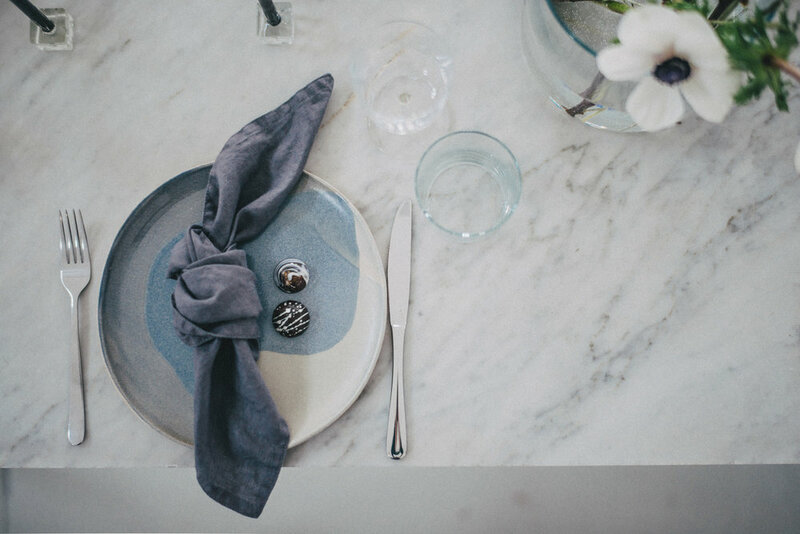 Clean modern glassware, simple cutlery and soft washed linen napkins in a mid grey complimented the beautiful ceramics rather than detract from them. 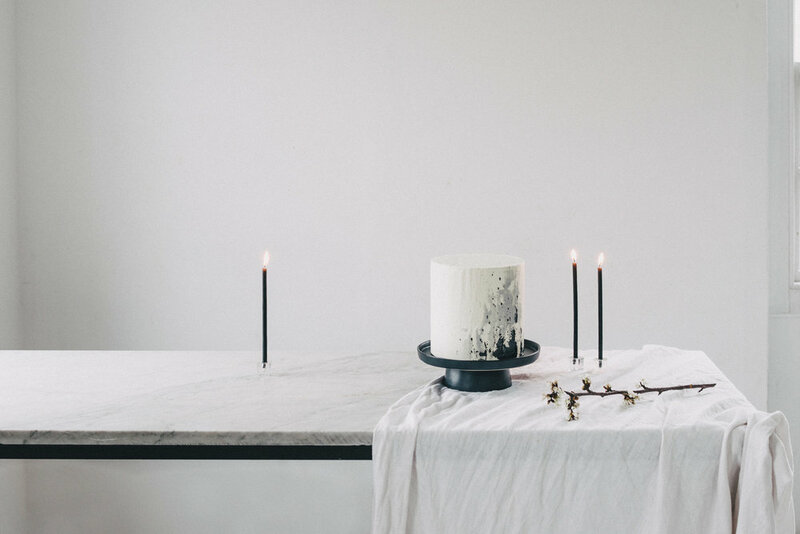 Layers transform a minimalist tablescape from overly simple to stunning. 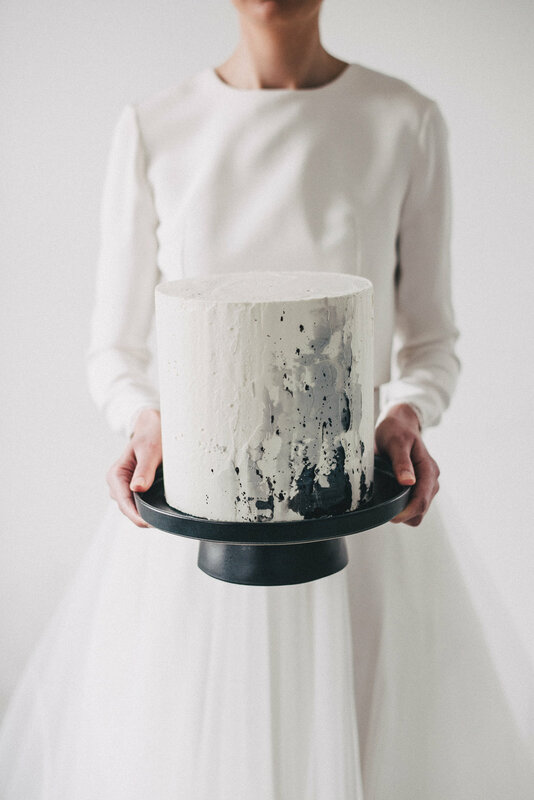 In this look we layered with delicate vellum menus by Vine in the Wild and beautiful marbled chocolate favours by The painted Peacock. 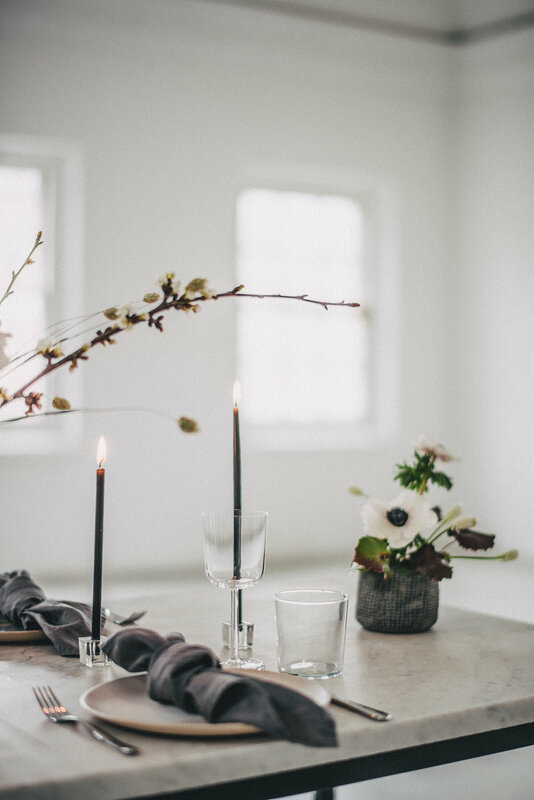 We added some height variance with smaller Anemone floral arrangements in textured stoneware vases and fine black taper candles, which added to the ethereal ambiance. 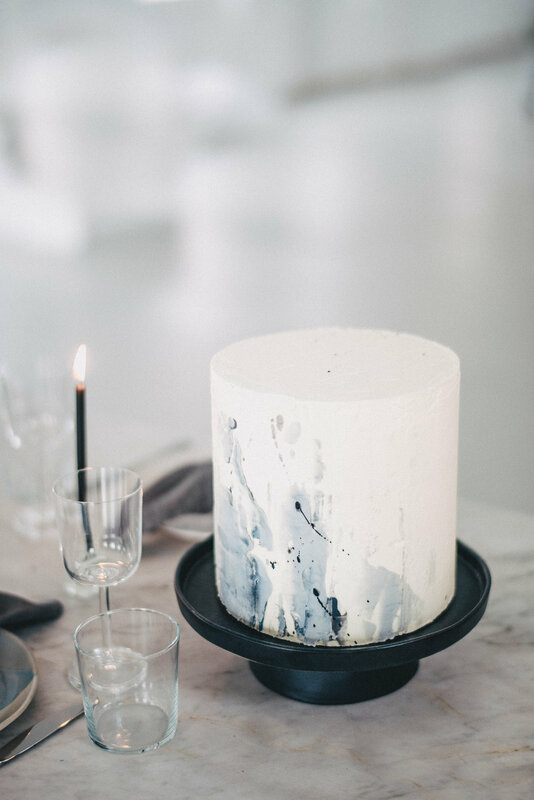 The beautiful cake created by Butter Beautiful totally summed up the essence of the shoot; understated, uncomplicated, elegant and impactful. It was cake perfection! Thank you to our wonderful shoot team!